Happy New Year’s Eve Eve! It’s hard to believe this year is quickly coming to a close. Therefore, I wanted to share one of my favorite gifts I made this Christmas for a few friends. DIY gift baskets! There are several companies that sell beautiful gift baskets that can be shipped all over the country. If you are like me you must have gotten about 100 of their catalogs over the course of the last month. I’ve bought a few of these baskets myself. They are great but sometimes very pricey once you add the cost of shipping and a bottle of wine. The beauty of making gift baskets yourself is you can truly customize each basket. I’ve made similar gift baskets before for our new neighbors. At Cost Plus World Market they sell individual baskets and basket making kits. 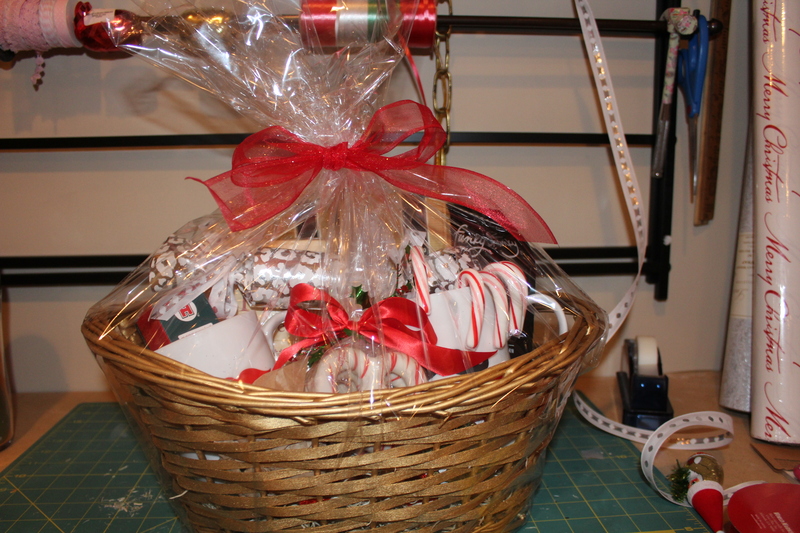 The kits include a basket, filler, a cellophane bag along with a ribbon and tag. You can also buy different colored filler separately to further customize your basket. The price of the kits range from $5.99 and up. They also sell just the cellophane wrap bags so you can use your own container. Personally I like to use my own ribbon and gift tags, too. I just think it’s prettier. World Market carries a huge assortment of cheeses, chocolates, crackers, coffees, etc. And their stocking stuffers were affordable and unique. I bought most of my basket stuffers here but also found a few fun things from Kohl’s and Target. This year I made two coffee and chocolate themed baskets, one wine and cheese basket and two assorted gift baskets. It was fun to personalize each one based on the recipient. I included some handmade party poppers which I also shared on my blog. Pop over and see how easy they are to make! I love how they turned out. Once I purchased everything I separated the goodies into piles in front of the coordinating basket. After I assembled the first one I realized it’s best to put the basket in the bottom of the cellophane bag and THEN fill the basket. I topped each basket off with a wired ribbon and gift tag. Ta-Da! A pretty and unique gift for someone special!